The Coasts have tweeted they’ve been in the studio early January, and again February 11, recording a follow-up to last years debut. I’m really looking forward to it. Centered around the talents of Little Rock, Arkansas/ Lebanon, Ohio pair, Ike Peters and Eric Mount, The Coasts are equally happy to thrash it out (Poltergeist), as they are to transcend lo-fi expectations by utilizing brass, harmonies, and a sweet falsetto (I Only Want You, Handshakers). It’s all couched in a blue Americana swag that draws a road trip of bars, diners, love lost, love found, with driving hours long enough to explore your own subtleties/ absurdities of character, gently, sometimes intensely. If distance does happen to keep you apart, or its a one-way trip, then there is always the melancholy stamina of Lullabye to fall back on. The Coasts have 294 followers on Twitter and 333 folk like them on Facebook, kinda makes them sound unknown. They’ve been posted in a number of ‘best of 2011’ lists however, including 24th in Rollo & Grady’s top 35 of 2011, so its only a matter of time I’d say. All the more reason to put some loose change down now; you can still buy their debut on Bandcamp for a fiver. 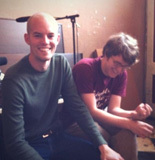 This entry was posted in Music and tagged Americana, lo-fi, The Coasts. Bookmark the permalink.